On the Turkish side the refugees are given rushed instructions as they huddle in a circle. There are 47 of them, children, men and women and they strain to hear every word that the smuggler is telling them. They know that this information might be the difference between survival and drowning. Their nerves are jangling, everyone is on edge and you can smell the fear. Most of these people have never been in a boat and they are about to attempt a crossing of the strait between Turkey and Greece in a dinghy. The wind is whipping and white caps are starting to form. “It is ok,” the smugglers say, “It will be harder for the Turks to see you.” The darkness is complete and they get the signal. They stumble over one another on the rocks to get into the dinghy until they are jammed in so tightly that it is difficult even to turn and look behind. They are shoved off from shore and the motor sputters to light. “Aim for the light! You will be safe.” The dinghy is sitting perilously low in the water and soon the tops of the waves are coming into the the boat. This is a fictional reimagining of some of the stories I heard in Skala. The light, however, is not safety. On the sea lights indicate hazards but these are not mariners and all they have is that little bit of information. 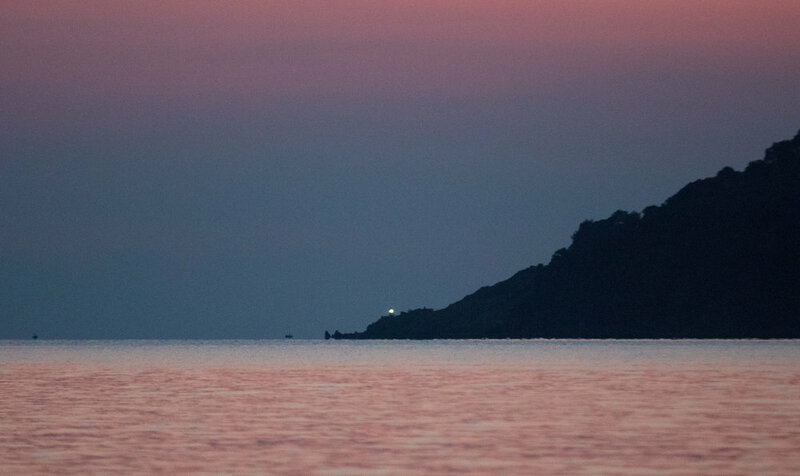 Over the last three years thousands of boats have made for that light and when they got there they found that there, within 50m of the Greek shore they were in the worst danger of the trip. Untold numbers of refugees have made for the light only to have their boats break up or be torn to pieces in the last 50m of a trip that has taken them 2 years to complete. I wanted a photograph that expressed this danger, this last great injustice for people who are running for their lives. There are wrecked boats all up and down the north coast of Lesvos. These ones are on Karakos. Refugee Rescue works to make those last 50m safe and I am honoured to work alongside. Two Greek fishermen at work in the evening off Korakas. The rocks that are visible are not even the most dangerous ones. There are several treacherous rocks just below the surface of the water right in front of the light house. These are the ones that have done so much damage.